The new Aston Martin Rapide comes with a Bang & Olufsen 1000-Watt, 15-speaker sound system as standard equipment. The premium Danish audio specialist's sound system uses seat belt sensors to determine the position of occupants and optimizes speaker output accordingly. In addition, the system adjusts volume settings to compensate for cabin noise, detected by a microphone behind the rearview mirror. ZF Lenksysteme GmbH delivers the Rapide's Servotronic 2 steering system, which assists driving during rapid maneuvering. System components include the rack and pinion, power steering gear, steering pump, and an electronic control unit. ZF Friedrichshafen AG provides the Rapide's six-speed automatic transmission. The Rapide, a four-door coupe-like sports car aimed at rivals such as the Maserati Quattroporte and Porsche Panamera, is assembled by Magna Steyr at its plant in Graz, Austria. About 240 workers are employed in the vehicle's assembly. It takes approximately 220 work-hours to produce each car. Aston Martin hired Magna Steyr's because the British automaker's plant in Gaydon, England, already is building at maximum capacity of 8,000 cars a year. Novelis Inc. supplies all the Rapide's aluminum sheet metal blanks to Magna Heavy Stamping. The Magna group subsidiary supplies material for the motor hood inner and outer, the roof and as well as for the front and rear door outer skin. A dry lubricant applied to the all the blanks means that no washing and pre-oiling is required prior to pressing. 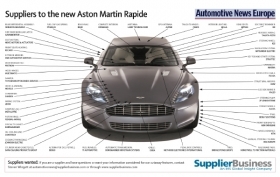 Other important suppliers to the Rapide include the BERU f1systems, which supplies the tire pressure monitoring system; Mitsubishi Electric Corp., which provides the navigation system with display; and Valeo SA, which contributes the car's xenon headlamps, LED turn indicators and LED side lights. Aston Martin unveiled the Rapide at the 2009 IAA in Frankfurt. Prices start at 144,950 pounds (about $230,000) in the UK and 180,000 euros (about $240,000) in Germany.